OCast dun roure, Eng of/from an oak. 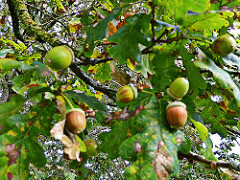 The term is used in reference to the fact that when the acorns stop falling from the tree in November, the pig is slaughtered as acorns are its primary food supply. Put ham and figs into a pot with bay leaves. Cover with water and boil 30 minutes. 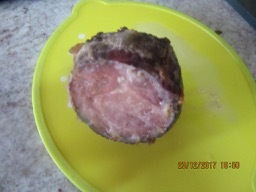 Remove from water and skin the ham. Make criss-cross incisions. Fill them with honey. Make a paste with flour and oil and cover the ham with this. Bake ham and serve. Dates were used as figs were not in season.